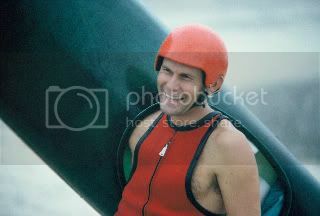 If you have any interest at all in waveski and/or kayak surfing, you are no doubt familiar with the name Mike Johnson. Yeah, he’s the guy who came up with the Mako designs as well as being very involved with Ocean Kayak’s Rrrapido and Infinity’s waveskis. You might even say he’s one of THE most important guys ever to get involved in paddle surfing in the US. I had a chance to chat with Mike recently and had a great time learning about the very early days of waveski and kayak surfing from his first person perspective. 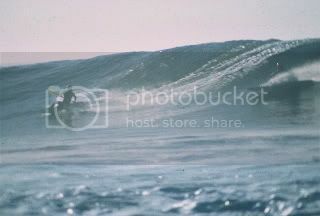 Mike was also kind enough to share some vintage pics of him and Merv Larson from way back in the 60’s when waveskis first started showing up in SoCal lineups. So with all that said, I would like to share some facts and pictures from Mike as well as a brief Q&A. 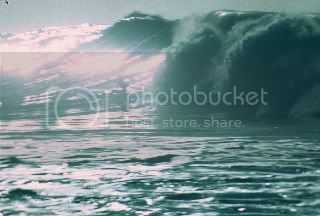 Mike is 68 years old as of the writing of this article and has been surfing for over 50 years. He got his start paddle surfing in 1966 when he got out of the Navy. The first waveski he rode was one that Bill Bragg built in 1964 for Olympic flatwater kayaker Terry Lentz as an alternative training craft. 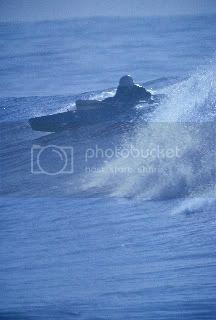 Here’s some pics of Mike on that ski at Huntington Pier. 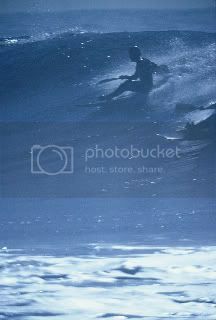 Following are pics from one day in 1969 that, in Mike’s words, was the very best day of surfing he ever had. 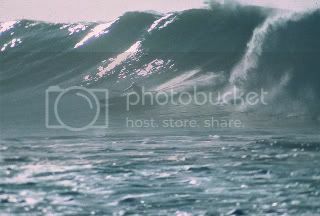 Mike described the waves as easily double overhead plus and just long, peeling and very surfable point break rights. 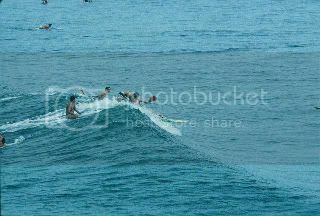 The paddle out was easy too and they surfed for over 4 hours. In other words, HEAVEN!! They even had a surfing contest that day and Merv Larson took first and Mike took second. Here’s some amazing pics from that day. Mike was also kind enough to share some pics of him and Merv Larson from the same time period. He pointed out that Merv (with the white helmet in these photos) had rigged up a waterproof setup with a small transistor radio and earphones that went into his helmet and he surfed to music back then! Keep in mind folks, this was the late 60’s/ early 70’s so it show that Merv was a pioneer in more than one way! The following pics are Mike with the green shoe and red helmet and Merv with the white helmet and round-nosed ski. I hope you all enjoy the photos as much as I did. Like I said, it was a real pleasure talking with Mike and I am grateful to him not only for the conversation and pictures he shared, but also for his huge contributions to the sport we all love so much! To wrap it all up, here’s a little Q&A I did with Mike. 1. How long have you been paddle surfing? 2. How did you get into it/who influenced you? When I got into white water paddling, a friend said he surfed his kayak, so I taught myself. 3. You’ve designed some of the best of each so do you prefer waveskis or surf kayak and why? 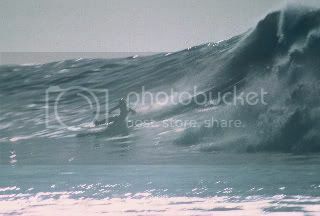 Waveskis. Less equipment, if you miss a roll, you can get back on anywhere. 4. What’s your favorite break? 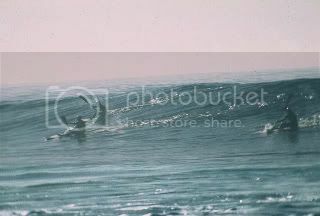 Rincon, followed by Steamer Lane, Swamiis, and San Onofre. 5. Talk a little about being an Olympian. A WW friend asked me if I wanted to train and go to the Worlds in flatwater kayaking. We made the team, went to Denmark in’70. Raced for 6 years ending in Montreal 1976. 6. How has the sport progressed in your 40+ years of participating? It started with modified WW boats. 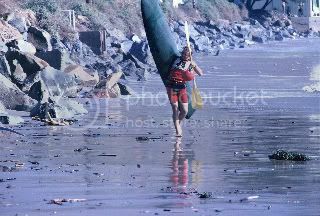 I made the first surf kayak in 1968. 13 designs currently, all based on my waveskis. The sport now has a life of it’s own. 7. What are your thoughts on fins vs. finless/triplaning hull design? Are there conditions you would rather have a finned ski? I’ve always been finless (my paddle and hard edges do the same as fins). Three plane acts like tail rocker along the whole side of the craft preventing catching rails. 8. Talk about your paddle designs. 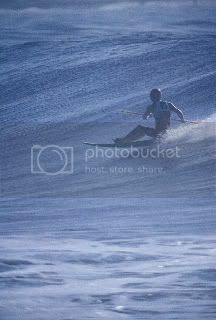 I have a very successful flat blade paddle that I have been making since 1972, designed specifically for surfing. Very light and popular. 9. You’ve worked with some of the pioneers in paddle surfing like Merv Larson, Ocean Kayak and Infinity. Talk about some of the highlights and challenges of working with each. Merv: met him in ’67 bought my skis from him, designed kayaks with him. He was the main pioneer of waveskis up into the early 90’s. Infinity: When I couldn’t get skis from Merv, I turned to Steve Boehne of Infinity Surfboards for my design skis and shaping my kayak prototypes Mako Skis & Kayaks. 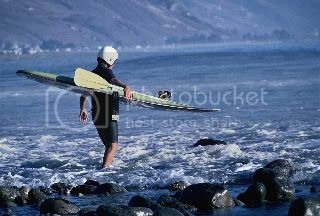 Ocean Kayaks: for a short time I worked with them to design the Rrrapido based on my 9’6″ Mako Ski. 10. What else do you like to do for fun? Snow ski, dirt bike and buggy riding. 11. Any tips to help newer waveskiers get better? Get a good user friendly ski (I prefer anything that come out of the Infinity shop www.infinitysurfboard.com. 12. How do you think we can promote the sport better here in the States? Just let people see how much fun we are having, and they can do it too. 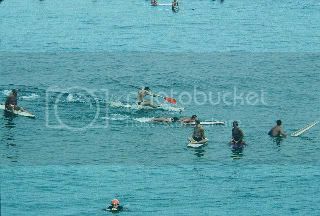 ← 2008 United States Waveski Championships Video. Mike’s a great and innovative guy and a very good friend. 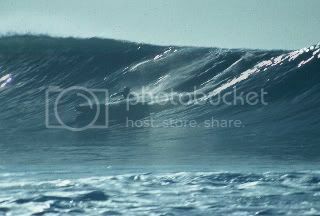 I’ve had the pleasure of paddle surfing 3 of the top 4 favorite spots mentioned with Mike – Steamers, Swamiis, and San Onofre. He took me to Rincon the day before nationals last year, but it was blown out so we didn’t paddle there, but I’ve caught great surf in the other three spots with him. I cut my teeth with his design first in surf kayaks, and now I surf his design on an Infinity waveski.